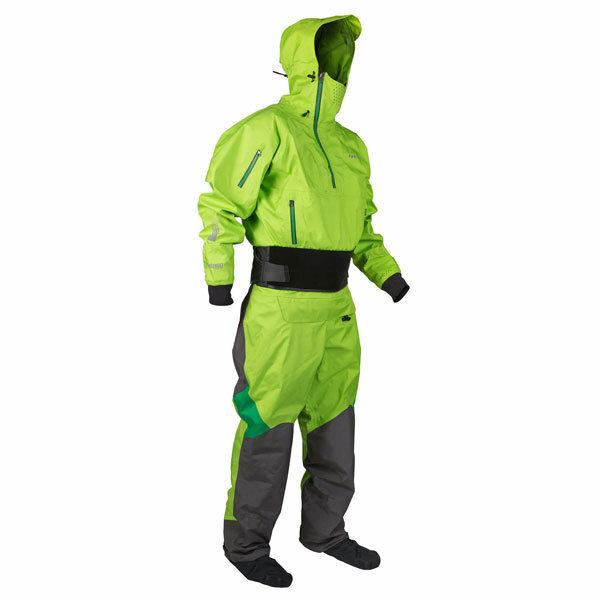 A high spec comfortable dry suit for sea kayaking, touring or instructing with a Glideskin neck and hood designed for all day comfort. 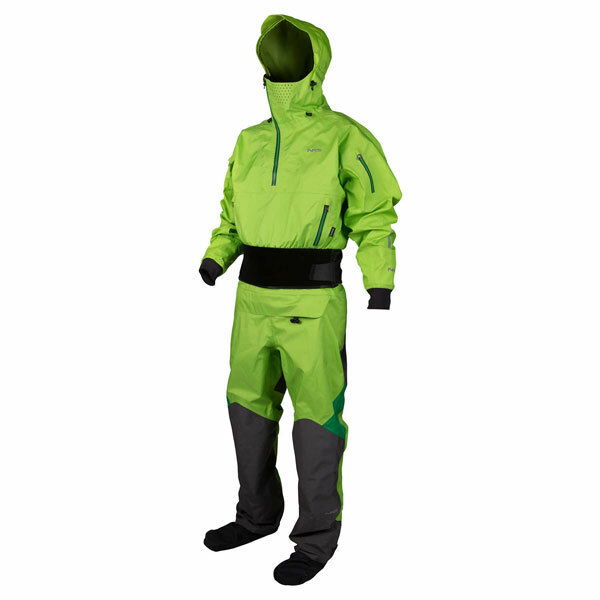 The NRS Navigator is the perfect suit for paddling all day in rough or cold conditions. The neck seal is made from super soft Glideskin which many find to be more comfortable whilst still providing an excellent seal. The wrists are latex sealed and the waist has a 13cm neoprene band with double hook and loop to form a watertight barrier with your spraydeck. 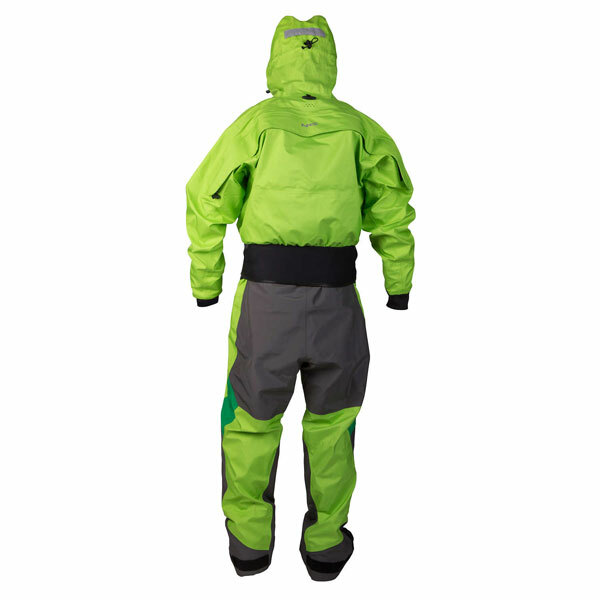 The suit is made from the amazingly light and flexible eclipse fabric which feels more like a 2 layer cag than an incredibly waterproof, breathable and tough 4 layer drysuit. Finally, the main and con zips are robust industry leading Tizips for ease of access and longevity. The suit is reinforced at the main wear points and the seams are designed for comfort when paddling. The Navigator has one of the best hoods we have ever seen, self draining with a precise volume to fit a helmet and an off centre zip for complete protection from the elements. Plenty of pockets allow essentials to be stored at hand and there is reflective piping for lowlight situations. Overall the NRS Navigator Suit has achieved the holy grail for any drysuit – you’ll forget you’re wearing it and paddle more as a result. Neoprene volcano-style neck gasket in place of latex. Zippers are covered with a hook-and-loop sealed flap for extra protection. Thigh pocket with splashproof zipper for handy storage. Additional layer of Eclipse material on seat and legs protects these high-wear areas. We offer a delivery service for the NRS Navigator Drysuit to home and work addresses throughout England, Wales, Scotland, Northern Ireland & Ireland. Buy a NRS Navigator Drysuit online from our website and collect from our store in Newhaven, East Sussex or from any branch within the Canoe Shops Group. There is no cost associated with this*.